I recently saw an interview with Damian Lewis, the actor who plays hedge fund billionaire Bobby “Axe” Axelrod in the TV show Billions, where he commented on the differences in reaction to the character in the US and the UK. Lewis said that in the US, the character is treated like an inspirational hero, whereas in the UK he’s seen as a villain. We all like to see a big shot hedgie fall flat on their face so us mere mortals can feel less stupid. The case of David Einhorn is not so clear cut. 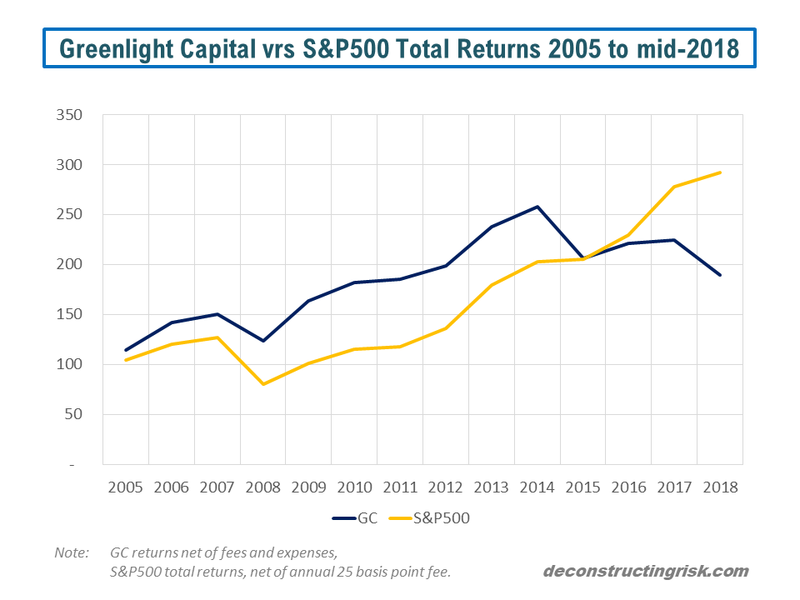 A somewhat geekie character, the recent run of bad results of his hedge fund, Greenlight Capital, is raising some interesting questions amongst the talking heads of the merits of value stocks over the run away success of growth stocks in recent years. Einhorn’s recent results can be seen in a historical context, based upon published figures, in the graph below. Einhorn recently commented that “the reality is that the market is cyclical and given the extreme anomaly, reversion to the mean should happen sooner rather than later” whilst adding that “we just can’t say when“. 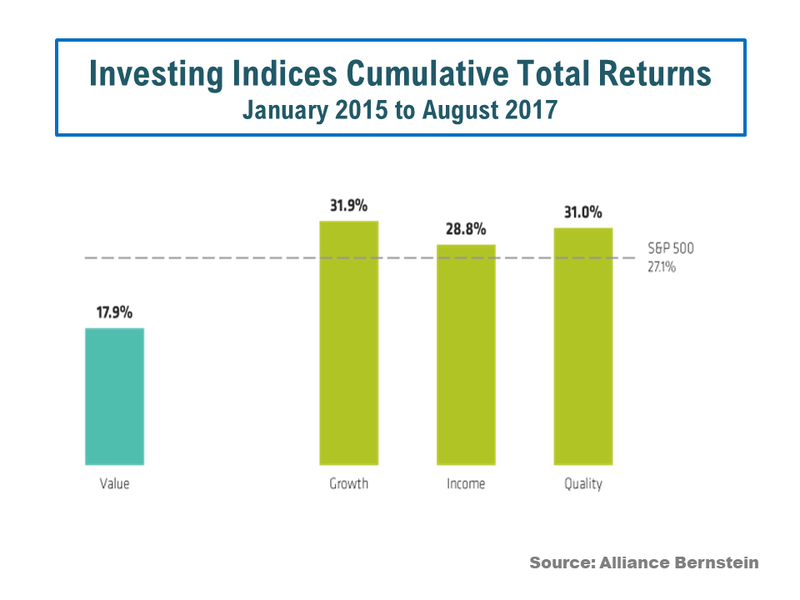 The under-performance of value stocks is also highlighted by Alliance Bernstein in this article, as per the graph below. 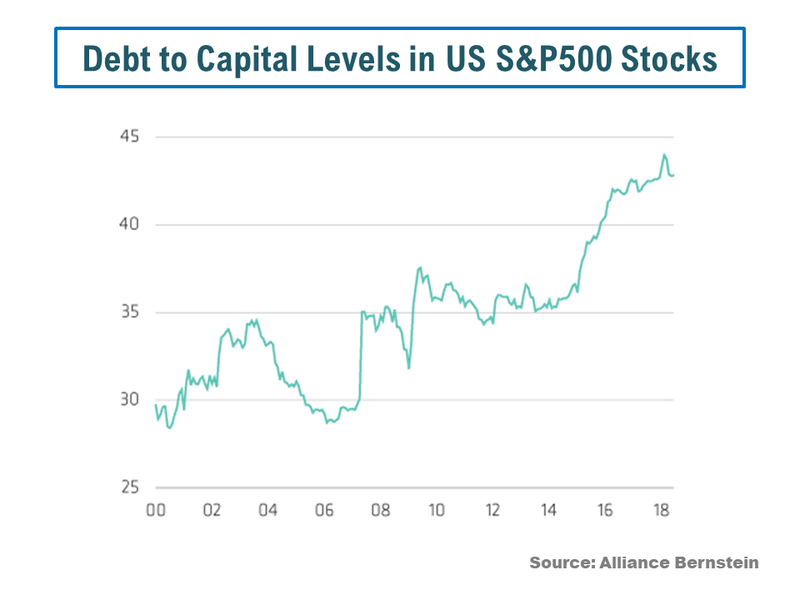 As an aside, Alliance Bernstein also have another interesting article which shows the percentage of debt to capital of S&P500 firms, as below. Einhorn not only invests in value stocks, like BrightHouse Financial (BHF) and General Motors (GM), but he also shorts highly valued so-called growth stocks like Tesla (TSLA), Amazon (AMZN) and Netflix (NFLX), his bubble basket. In fact, Einhorn’s bubble basket has been one of the reasons behind his recent poor performance. He queries AMZN on the basis that just because they “can disrupt somebody else’s profit stream, it doesn’t mean that AMZN earns that profit stream“. He trashes TSLA and its ability to deliver safe mass produced electric cars and points to the growing competition from “old media” firms for NFLX. 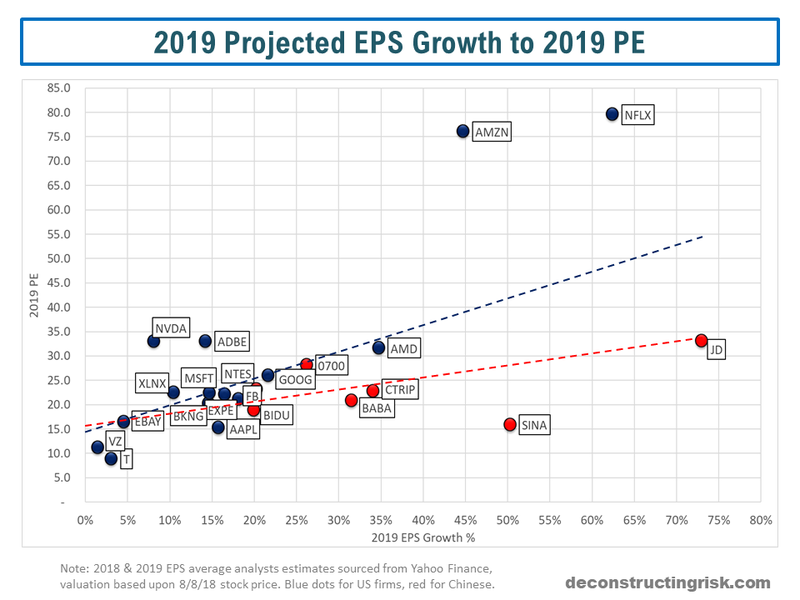 A quick look at the 2019 projected forward PE ratios, based off today’s valuations against average analysts estimates for 2018 and 2019 EPS numbers from Yahoo Finance of some of today’s most hyped growth stocks plus their Chinese counterparts plus some more “normal” firms like T and VZ as a counter weight, provides considerable justification to Einhorn’s arguments. And the graph above shows only the firms with positive earnings to have a PE ratio in 2019 (eh, hello TSLA)!! In fact, the graph makes Einhorn’s rationale seem downright sensible to me. Now, that’s not something you could say about Axe! This entry was posted in Equity Market and tagged 2019 PE ratios, Alliance Bernstein, Amazon, AMZN, big shot hedgie, Billions, Bobby Axe Axelrod, bubble basket, Chinese internet stocks, Chinese valuations, cyclical market, Damian Lewis, David Einhorn, forward PE ratios, General Motors, GM, Greenlight Capital, mean reversion, Netflix, NFLX, Tesla, TSLA. Bookmark the permalink.